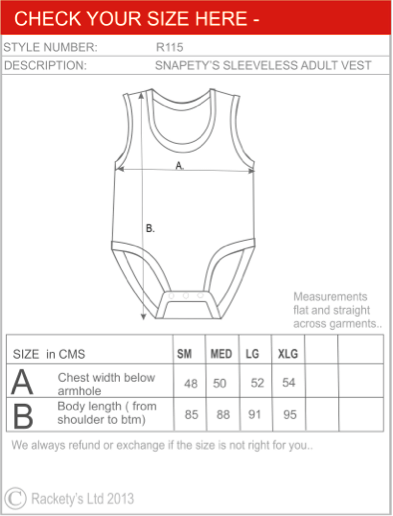 R43 Snapety sleeveless vest for adults. Soft cotton slightly stretchy vests that keep everything in the right place, stop the embarrassment of nappies being on display, and keep you or the person you care for warm and comfortable all day and through the night. Rackety’s bestselling vest, great as a start point if you have not tried a popper vest before. The garment is suitable for ladies or men. Soft cotton interlock knit fabric with elastane for comfort..